(Trent Nelson | The Salt Lake Tribune) Mia Love makes a statement at her election night party at the Hilton Garden Inn in Lehi on Wednesday Nov. 7, 2018. President Donald Trump praised Republicans for expanding their majority in the Senate on Wednesday, while offering harsh criticism to GOP House members — including Utah’s Rep. Mia Love — who failed to wholeheartedly embrace his agenda. Trump said Love had called him “all the time” asking for help freeing Utahn Josh Holt, who had been imprisoned in Venezuela. But her re-election campaign distanced itself from his administration, the president said, which led to her poor performance in Utah’s 4th Congressional District. "Too bad, Mike...Sorry about that, Mia." Love is currently trailing her Democratic challenger, Salt Lake County Mayor Ben McAdams, by less than 3 percentage points. A significant number of ballots remain uncounted in Salt Lake and Utah counties, leaving the race too close to call until new totals are released. Dave Hansen, Love’s campaign manager, declined to respond to Trump’s criticisms but emphasized that the election results have not yet been finalized. However, earlier this week, Hansen said that Love likely would have easily won if Hillary Clinton had won the presidency in 2016 — because Utah Republicans would have been more energized to fight Clinton and help Love. The McAdams campaign declined media interviews on Wednesday, but indicated it was too early to declare victory in the race. Love is the only black Republican female member of the U.S. House. 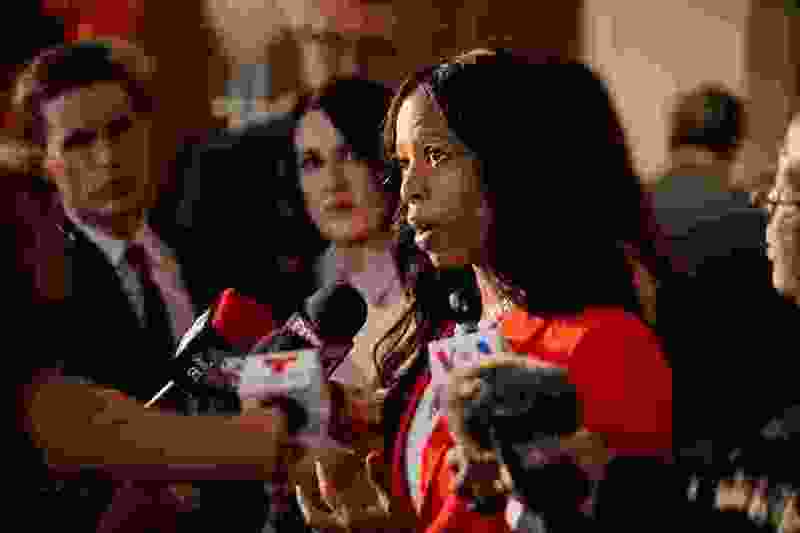 She used the Josh Holt episode as a major part of her campaign, with Holt, his mother and other family members appearing in an ad blitz on Utah airwaves in the election run-up. The ads portrayed Love as the key to Holt’s release and safe return home, without any mention of the role of Trump and his administration. It was consistent with the way Love has kept her distance from Trump, who is far less popular in Utah than other Republican presidents have been in the state for decades. Trump has higher disapproval ratings in the 4th Congressional District than most areas of the state, with about 56 percent of registered voters in the district disapproving of Trump, according to an October poll. While Love has voted with Trump 95.7 percent of the time, according to FiveThirtyEight, she has publicly criticized him several times, particularly on immigration. As recently as last week, she opposed Trump’s stated intention to use an executive order to do away with what is known as birthright citizenship. Love herself became a U.S. citizen under this constitutional provision when she was born in Brooklyn, N.Y., to parents who had immigrated from Haiti. Earlier this year, she had called out the president for reportedly describing Haiti, El Salvador and African nations as “s---hole countries.” Love said the president should apologize. The list of Republican incumbents and candidates criticized by Trump on Wednesday also included Sen. Jeff Flake, R-Ariz., a frequent critic of the president who elected to retire from the Senate rather than seek re-election this year. Trump took personal credit for Flake’s retirement and suggested the country is better off without the Republican senator. Rep. Ryan Costello, R-Pennsylvania, tweeted an apparent defense of Love and the other Republicans insulted by Trump. The retiring lawmaker expressed frustration that Trump would “piss on” defeated incumbents after causing them to bite their lips and deal with harassment caused by the president's administration. “Angers me to my core,” Costello wrote. Trump was characteristically combative during the news conference, declaring the results of the midterm election as a personal victory — despite Republicans losing control of the House — and stating that he would take a “warlike posture” against Democratic attempts to hold his administration accountable. He also reiterated his criticisms of the national news media, equating coverage of polls to “voter suppression,” deriding press questions as “racist” and frequently complaining that he could not understand members of the international press and journalists of color. Reporter Lee Davidson contributed to this report.